If you follow Marvel Toy collecting then you know the community has been buzzing this week with Hasbro's confirmation that the formerly-cancelled Agent Venom Marvel Legends figure will be released this August as an exclusive. More shocking was where the exclusive would be sold--Walgreens, the ubiquitous corner drug-store chain. This is the first time Walgreens has carried an exclusive Hasbro toy, but per our sources another may be coming very soon. 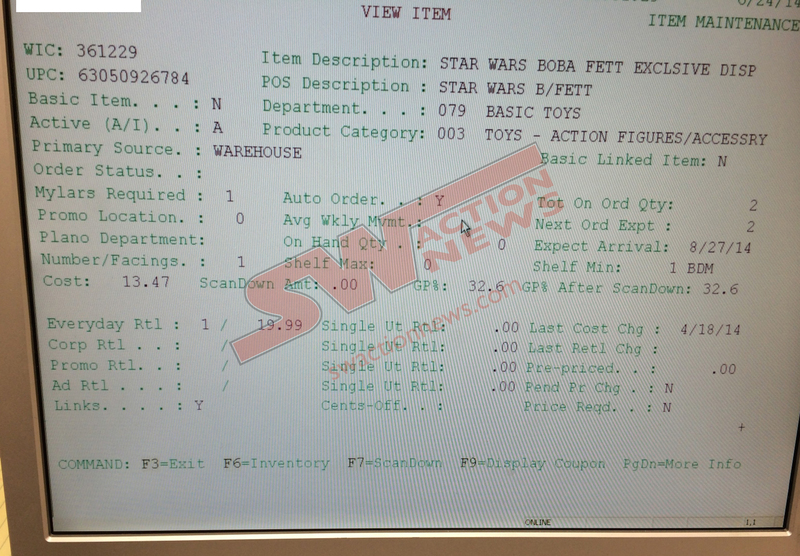 We received an e-mail with the included screenshot from a Walgreens system showing that there also is a Star Wars exclusive action figure coming to Walgreens. 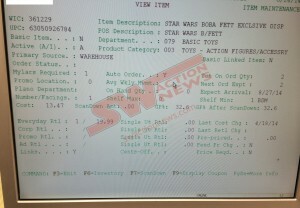 The listing reads "STAR WARS BOBA FETT EXCLUSIVE DISP" and is listed as "ACTION FIGURES/ACCESSRY". The retail price shown is $19.99, which seems inexpensive for a Black Series 6-inch figure (given Walgreens inflated prices) but overpriced for a 3.75-inch figure. Our source speculates it may be a repainted Boba Fett 6-inch, perhaps in the white McQuarrie colored armor, or perhaps with the Return of the Jedi markings. (Hasbro's Darryl DePriest has said the intent was to have last year's San Diego Comic-Con exclusive be the Boba Fett and the regular retail version have Return of the Jedi coloring). The expected arrival date is listed as August 27, 2014--around the same time the Venom should be hitting the corner of happy & healthy. We have reached out to our friends at Hasbro asking for confirmation. More news as we get it! And, as always, all news is considered rumor until confirmed by Hasbro. What do you want the figure to be? Let us know in the comments below! Agent Venom is showing up in stores before this, the 8/30 date that Marvelous News has is wrong, that is just the particular date that one particular store is getting them in stock. Same as this. This is just one store’s first arrival. Also, this does not match up with the UPC from the Black Series Boba Fett, which is 653569897811. It is doubtful this is the exact same Fett, and the fact it is listed as linked means that there are other figures in the display.